"A renegade wave of talented chefs with Texas-size ambitions and rock-and-roll swagger is turning Austin into America’s next great food town—and, as Peter Jon Lindberg reports, barbecue is just the beginning"
Our menus are memorable thanks to celebrated staples like breakfast tacos from east side favorite Juan in a Million or the creative concoctions at Torchy's Tacos, as well as Tex-Mex treats paired with top shelf pitchers of margaritas at off the beaten path places like the patio of Polvos on South 1st Street. Then there are the water-front locales for the boat riding flip-flop set, like family-favorite Hula Hut on Lake Austin or the Lake Travis situated, "sunset capital of Texas", the Oasis. 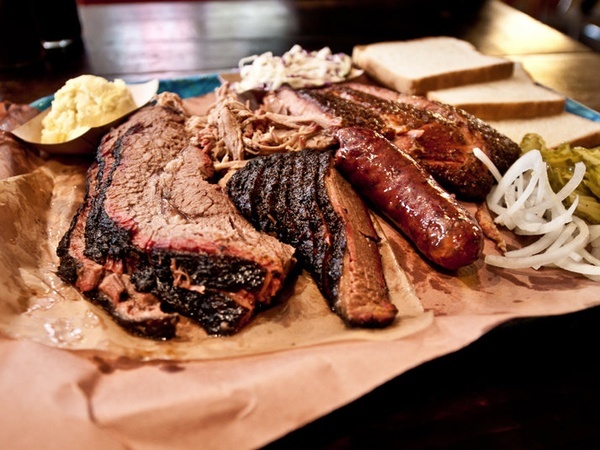 And lest we forget our bib-required BBQ at laid-back locales like the lick your fingers favorite La Barbecue, the likes of where the owners are greeted daily with throngs of ravenous brisket addicts and the line doesn't stop moving until the pit master runs out of goods.